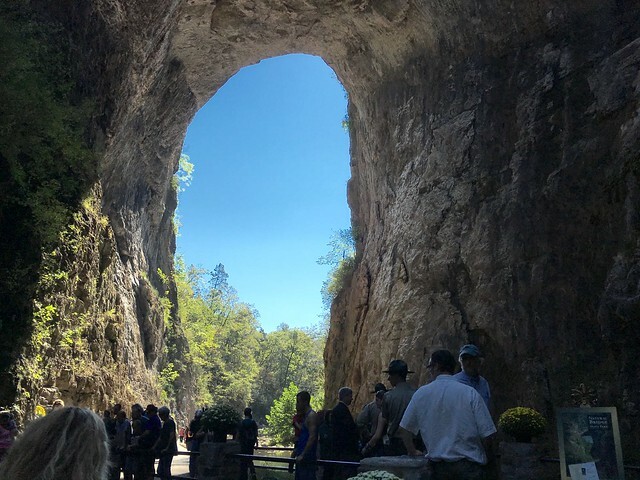 It was appropriate that on National Public Lands Day, Governor Terry McAuliffe officially opened Natural Bridge State Park, the 37th Virginia State Park. The Natural Bridge has been in private hands since Thomas Jefferson bought it for twenty shillings from the King of England. Operated as a Tourist Attraction for years, the iconic landmark was threatened by development when the latest owner readied for retirement. Thankfully Tom Clark and the Virginia Conservation Legacy Fund stepped in and bought the property. While Virginia State Parks and the Commonwealth will not own the land until the debt is paid, Sept. 24, 2016 marks the beginning of operation as a Virginia State Park. The event was worthy of such a special occasion. The site has also been recognized as the 25th Affiliated Unit of the National Park Service. Virginia State Parks staff from across the state came to help out with the grand opening event that included free admission to all visitors. State management will mean a significant drop in the entrance fees. Beginning on Sept. 25 the admission fee will be $8 for age 13 and up, $6 for ages 6-12, under 6 is free. Admission for up to 4 people is covered by paid Virginia State Park annual passes.